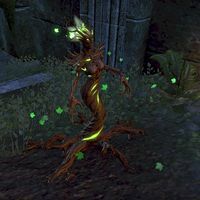 Spriggans are tree spirits that adopt a female-like form. They are hostile and difficult to kill due to their ability to self-heal and summon allies to their aid. The spriggan summons a swarm of insects, dealing moderate physical damage to all enemies in front of it as indicated by a red cone. the spriggans will summon an animal to assist it in combat. The animal will remain even if the spriggan is killed. These animals are usually appropriate to the zone the spriggan appears in, and include bears, durzogs, spiders, senche-tigers, and wolves. The spriggan will channel a buff on the animal, causing it to do double damage. This spell can be interrupted to set the spriggan off balance. When hurt, the spriggan will heal itself. This spell can be interrupted to set the spriggan off balance. This page was last modified on 3 February 2019, at 08:06.